Plus – well, I just can’t help checking out what the options are for little guys, so I’ll occasionally order an item in the interests of researching a new supplier. Recently, I purchased a romper and a shirt from someone, and I was incredibly impressed with the quality of the materials and service. The feature that I loved most was the clasp sewn into the shirt for a pacifier ribbon. Forget about putting pins into a boy’s onesie or shirt, it’s ‘built right in’! But aside from being really well made, the clothing reminded me that an ideal world, every little guy will have as complete a wardrobe as possible. This can mean scouring the local stores for clothes with bright patterns and cute designs. It can mean having snaps sewn into the legs of shorts or overalls. Or it can mean ordering online from trusted suppliers, although not everyone will have the means for that. The idea that an adult baby or little boy might have anything other than a fairly complete wardrobe makes me feel kind of sad. Every little guy deserves to be able to express his personality and it shouldn’t feel like it’s reserved for special occasions. The same, of course, goes for diapers – it’s daddy’s job to make sure, if nothing else, that a boy knows that he should use his diapers freely and never worry about running out or having a dwindling stock. But when a daddy goes to pick out an outfit for his little guy to wear – whether out to the park, or for time in his playpen, he should be able to choose from a cross-section of clothes that have been chosen to suit his boy’s personality, the activities in a typical week, and the age of his spirit. Now, I have a soft spot for shortalls and I’ve written about them before. 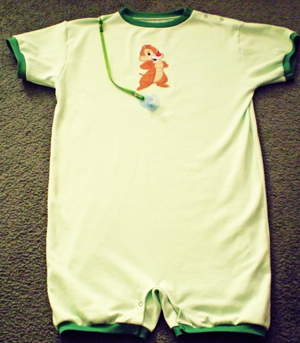 And onesies are a necessity, including for ‘older’ boys – they help to keep a diaper snug and secure. But I also get a warm, special feeling when I see a boy in a romper. A romper is playful, practical, and cute! When a little guy is put in a romper it’s almost as special for him as being able to play or cuddle in just a diaper. He has the benefit of a onesie and cute little shorts all rolled into one! For daddy, there’s something reassuring about a romper: it keeps the boy’s diaper nice and secure, is suitable for crawling on the carpet, and the snaps along the legs make for easy diaper checks and changes. The clear bulge of the diaper and the fact that the crinkle sound isn’t muffled by jeans, gives daddy a special feeling of reassurance that his little guy is diapered like he should be, and that with frequent checks, he’ll be able to quickly change him out of a wet or messy diaper and have him on his way again to constructing buildings from blocks or hugging his teddy in his playpen. So while not every boy will have a stuffed closet of clothes, if there were a few necessities I think a romper would be one of them. I really enjoy having AB clothing around when I’m in the mood for it; I’ve even had my share of rompers. The only disadvantage of having such clothes is the possibility of growing out of them. I’m in fairly good shape, and I’ ve run into the problem of literally out-musceling the things I do buy. My shortalls don’t fit anymore due to my chest and thighs getting larger (I bought them when I was almost anorexic), as is the case for one of my onesies and rompers. I usually just go around in a tshirt and diaper when I’m feeling babyish. It’s quick, cheap, cute, and makes it easy to know if I need to be changed. I would love to know the name of a reliable maker of toddler clothes, if you have found one that you trust please let me know. I so love being dressed in a onesie, romper, snap crotch pants or shorts and boyish shirts. I love my shortalls too. It makes me feel boyish and like I want to go play in the dirt with my tonka trucks! I love going out in public dressed like this too. Now all I need is the Daddy to dress me this way and care for this tall diaper boy. wow, i love rompers. i have a spiderman romper and a baby blue romper. wish i had one with cookie monster or blues clues. Another absolutely brilliant piece of writing from Daddy. While Daddy may get warm and fuzzy from seeing his baby in diapers, as a little boy, I get the same warm and fuzzy feelings when my partner puts me in one and leaves me to play all day. It’s a truly amazing feeling. where can i get some adult baby clothes in the usa on the web ok help me i like the romper of the boy in it i like to getone like it and i am looking for a daddy to help me? Hi Mathew for all of your adult baby clothes and accessories try looking on e-bay, just search adult baby. This is where I bought my first onesie and binky. Some stuff is over priced and others ar cheap depends on size really. I wish I had a daddy to shop for cute outfits for me but right now its left up to me to take care of this and the task of diapering and babying myself. thats where I go for all my stuff!! The prices are a bit high, but the quality is GREAT. FAR less expensive than Privatina, and the inventory changes frequently with new items getting listed all the time. That’s the cutest damn romper. WANT. Link? Where do you buy rompers like that? Those are the exact style I have been looking for! I like to run around in just a diaper and a cut off t shirt that just sits above my plastic pants.. This way I can see whats up in the pants!! Previous PostPrevious Swim Diapers for the Adult Baby?